The European Commission has proposed on May 24th a safeguard clause to be inserted in the EU visa legislation, that would allow for a temporary reinstatement of visas for third countries only in "exceptional circumstances." 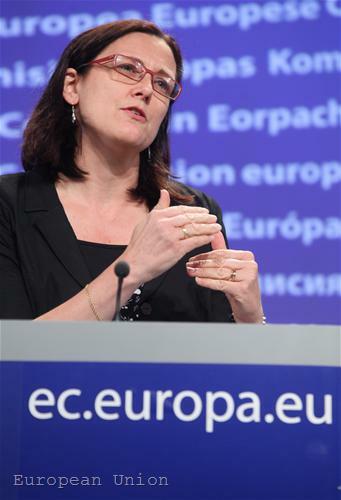 EU Home Affairs Commissioner Cecilia Malmstrom stressed several times at a news conference in Brussels that the mechanism would be activated only as a last resort and was not directed against any specific country. She highlighted that the Commission did not propose suspension of the visa free regime for any country. Malmstrom however admitted that there were problems with some countries and that the Commission was engaged in a dialogue with them to find a solution to the problem. A temporary suspension of the visa-free regime would not come automatically and its implementation would be only a last resort, she added. 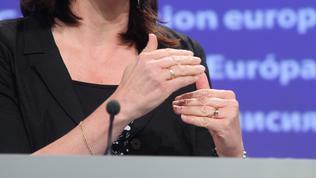 The Commission proposal will be discussed by the EU interior ministers at their meeting on June 9th. Despite the explicit claims that the clause is not directed against any country, the truth is that the proposal comes because of the serious visa abuses with the visa-free regime by Serbian and Macedonian citizens. Serbia and Macedonia were included in the so-called Schengen white list in late 2009. Since then, EU member states have been overflowed by asylum seekers. One of the most affected countries was Belgium, who said it would reject the application documents as they were based on purely economic reasons. Citizens of the two countries have been sent back home in a mass because of visa-free abuses. The gravity of the situation can be supported by concrete numbers. In 2009, 200 Macedonians applied for asylum in Belgium, while last year their number increased five times, climbing at 1,082. During the first four months of this year 362 people have applied for asylum. According to the local immigration office, Macedonia is ranked seventh by the number of asylum seekers in Belgium. The data for Serbia do not differ a lot. Despite the registered 35% drop of asylum applicants, their number is still high. From September 2009 till December last year 17,715 Serbian citizens had applied for asylum in EU member states with Belgium, Germany, Sweden and Luxembourg being the most attractive destinations. Asylum seekers are not the only ones to blame for the visa-free abuses. They indeed come from poor and less developed regions, where there is no perspective for development and therefore they believe that they can leave their home country and go to some European country to benefit from welfare. The authorities themselves bear more responsibility because they have failed to inform from the very beginning the people about their rights and obligations under the visa free regime. Such a media campaign was launched in Bosnia, which was included in the white Schengen list a year later and has no problems with the regime so far. Serbia and Macedonia realised that they have to tighten control only when the risk of reintroduction of visas had emerged. The authorities now envisage a series of measures - starting from enhanced checks of documents, money and round-trip tickets to control of tourist agencies, to tough financial and criminal sanctions against people or companies that breach the visa free regime. The governments in Belgrade and Skopje should take measures also in order to encourage economic activity in the poorer areas, where most of the asylum applicants originate from. Because people do not flee from good but do flee searching for something better. The safe-guard clause is a part of the measures proposed by the EC for a more efficient and fair migration policy of the EU. The main goal of the measures is better management of the migration flows from the Southern Mediterranean region. The initiative is the second stage after the Commission's communication on migration published on May 4th.